Rare Oscar Wilde ink signature, “Oscar Wilde” on an off-white clipped slip. 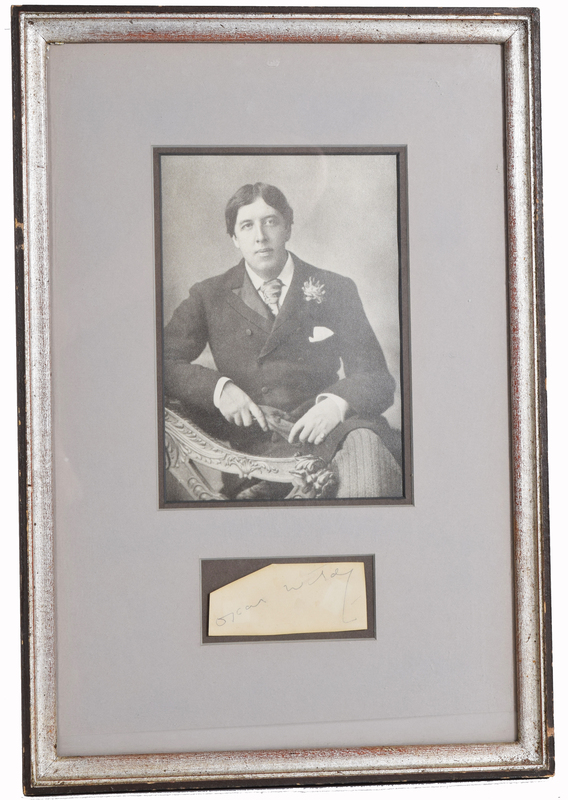 In fine condition,, 9"h x 4-3/4"w. Oscar Fingal O'Flahertie Wills Wilde (16 October 1854 – 30 November 1900) was an Irish poet and playwright. After writing in different forms throughout the 1880s, he became one of London's most popular playwrights in the early 1890s. He is best remembered for his epigrams and plays, his novel The Picture of Dorian Gray, and the circumstances of his criminal conviction for homosexuality, imprisonment, and early death at age 46. Wilde's parents were successful Anglo-Irish intellectuals in Dublin. Their son became fluent in French and German early in life. At university, Wilde read Greats; he proved himself to be an outstanding classicist, first at Dublin, then at Oxford. He became known for his involvement in the rising philosophy of aestheticism, led by two of his tutors, Walter Pater and John Ruskin. After university, Wilde moved to London into fashionable cultural and social circles.